Viruses function by reproducing. However, in the real sense they do not really reproduce, but multiply. The virus structure is made in a way that allows it to replicate itself, thus creating numerous viruses. This is the reason why many will refer to the process as reproduction. There are two main ways that viruses reproduce or multiply and these are listed below. 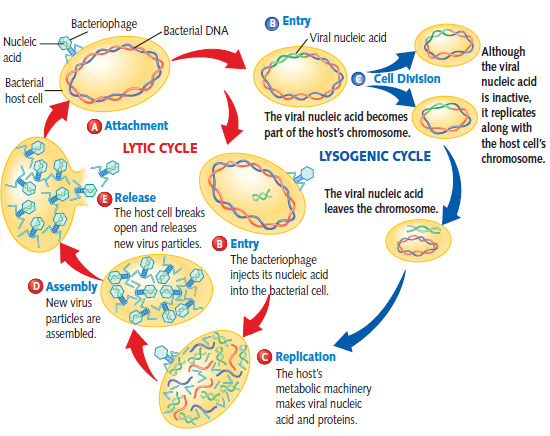 Lytic Cycle: With the lytic cycle, the virus attaches itself to a host cell and infuses the cell with its nucleic acid. This acid takes the host cell hostage and the virus begins to multiply with nucleic acid and its protein coat thus developing into new viruses. The host cell is eventually overcome with the new viruses and just like a balloon does when it has too much air, it bursts. The newly formed viruses then carry on with their lytic cycle by searching for new host cells to invade. Lysogenic Cycle: There are viruses that enter into a host cell but are slow to multiply and these include the HIV virus and herpes. While the viruses’ nucleic acid is present in the chromosome, it is not active and therefore does not immediately affect the cell’s function. However, it will eventually separate from the genetic material of the host cell and take over to multiply. The release of new viruses ultimately kills the host cell giving rise to the lysogenic cycle. How do viruses reproduce? A detailed image on the reproduction of viruses can be viewed in the image below.